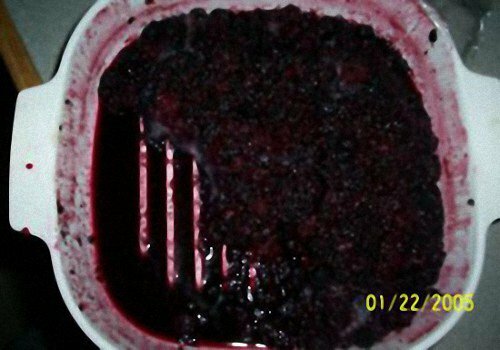 You'll love trying this easy blackberry cobbler recipe. Cobblers are a great substitute for pie and are a simple dessert to make. Feel free to substitute blueberries in the recipe should blackberries be unavailable. A blueberry cobbler is also delicious. Enjoy a true comfort food tonight! 1-2 cans of Grands!® Homestyle Buttermilk Biscuits from Pillsbury®. I have rounded the ingredients to make sure it's perfect. Preheat oven to 375°F. Place water, sugar, and blackberries in a large pot, then heat until sugar is dissolved and water is boiling. Taste to make sure the liquid is sweet enough; if not, add sugar as needed. While heating berries, grease a 20 x 18-inch pan [or spray with Crisco®], place biscuits (unbaked) in pan. Flatten biscuits until they cover the bottom of the pan. Pour blackberries in pan on top of the biscuits using a spoon to even out the fruit. Place in 375°F oven for 25 to 30 minutes or until the biscuits rise. Take out of the oven when done and let cool. Enjoy! The whole family will love it! A writer in the Western Rural gives the following very nice ways of using this delicious fruit in season. Take nicely ripe blackberries and sweet milk, each 3 pints; eggs, well beaten, 5; sugar, 1 cup; a little salt; yeast powder (the author would suggest baking powder, as it acts quicker), 2 teaspoonfuls; and flour to make a suitable batter to handle with a spoon. To be eaten with any sauce, or the following jam. To each pound of the berries put, for present use, half as much light brown sugar, and boil to thoroughly cook the fruit, and use as sauce for the pudding. For longer keeping, for winter use, use berries and sugar equal weights, and cook carefully 1 hour, stirring constantly to avoid burning. It is a cheap and excellent preserve, of which the children are very fond. A visitor wrote to ask, "Since these are supposed to be old vintage recipes, WHY would she use Pillsbury® canned biscuit dough in the cobbler???" You might be surprised to know that canned biscuits are considered vintage, and many grandmas were quick to adapt them into their favorite recipes because of their convenience and good taste. They were invented back in 1930 by a Kentucky baker, Lively B. Willoughby who sold 10 biscuits separated by tinfoil and oiled paper in cardboard tubes. Willoughby's popular marketing idea was obtained by the Ballard Flour Company and patented in 1931, called the oven-ready buttermilk biscuit. The Ballard Flour Company along with its canned biscuit product was later sold to Pillsbury Mills, and the rest, as they say, is history.